A Ukrainian MP, notorious even among his colleagues for making his political point with his fists, was caught on camera ambushing a long-time rival after a TV debate and later vandalizing the man’s car. Vladimir Parasyuk is one of several MPs in the current Ukrainian parliament, the Verkhovna Rada, who got their positions by capitalizing on the publicity they gained as leaders of paramilitary units which played a key part in overthrowing Ukraine’s previous government. 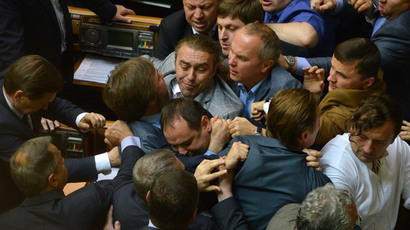 During his days as a lawmaker with immunity from prosecution, the cocky 29-year-old has engaged in several brawls with Ukrainian officials, both inside the Rada and in other offices. One of his opponents is Aleksandr Vilkul, whom Parasyuk and several likely-minded MPs forced to leave the parliamentary rostrum for speaking Russian. The conflict reignited on Thursday, when both were invited to a political talk show at television Channel 112. After the heated live debate, Parasyuk ambushed his opponent in a corridor of the studio and tried to engage in a fistfight. However, the brawl was quickly broken up by Vilkul's bodyguards, footage of the altercation published by the channel showed. Apparently not discouraged by the failure, the pugilist MP found his opponent’s car parked nearby and tried to break its doors and side mirrors. Parasyuk is notorious for physically attacking people he doesn’t like. In November last year, he beat up a prosecutor who was involved in a criminal case against a fellow nationalist politician. Weeks later, he kicked in the head an anti-corruption department chief of SBU, Ukraine’s state security agency, who spoke dismissively about the Maidan events of 2013-14. In January, he threw a glass at three judges who ordered the arrest of a paramilitary unit member. He also tried to force his way into a Russian consulate in March, but was stopped by its guards. Instead Parasyuk tore down the Russian flag from the building and had it burned. The latest brawl is a sign that the current parliament must be scrapped, said former Georgian President Mikhail Saakashvili, who resigned his original citizenship to become a Ukrainian and take the position of governor in Odessa, Ukraine.